I really admire people who are super organized and schedule everything, keeping track of both important dates and daily routines for their businesses and personal lives. Online, I came across the bullet journal and have been following some people as they plan and track their lives in their notebooks. I also joined some Bullet Journal or “BUJO” (for short) Facebook groups to learn more and get motivated. What is a bullet journal? It’s like a planner, but it’s blank inside….so you get creative and design pages that suit you and your lifestyle and preferences. One of the most popular journals is the Leuchtturm1917, which has smooth pages with dot grids. There are lots of ideas on Pinterest and YouTube and Instagram if you don’t know where to start. I made a couple of YouTube videos too! There are many different ways to use a Bullet Journal, but I decided to create monthly calendar spreads and weekly spreads, plus monthly cover pages. Here is a look at a weekly 2-page spread from July, which was featured on the Creative Scrapbooker’s blog. Click HERE to see the blog post on how the spread below was designed. Of course I was attracted by all the calligraphy and hand lettering possibilities with this method of planning! lol I use lots of pens, but for these pages, I was using mostly Tombow products, which are awesome for planning and journaling. Tombow has some new markers called TwinTones, which have a bullet nib on one end and a fineliner on the other. They are really fun to use in bullet journals! The good news is I’m feeling much more organized having all my ideas and schedules in one place. Since I’m a visual type, making the time to write and draw and plan in a journal seems to be the right thing for me. 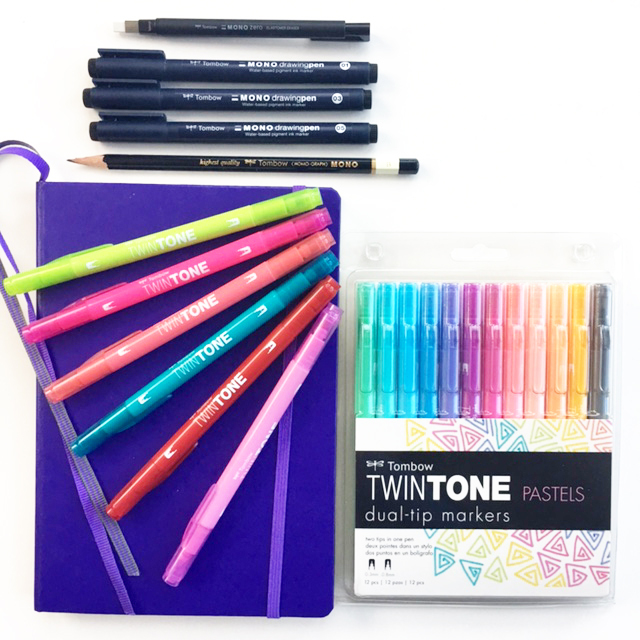 If you’re interested in these supplies I used, here are some affiliate shopping links for you to click (just click on the products) to help you get started with your bullet journal! Your journal is beautiful! If you designed one for 2018, I would buy it!